remote tools provide network-wide visibility and control, and enable administration without on-site networking expertise. deep packet inspection, with advanced security features including IPS, content filtering, web search filtering, anti-virus - anti-phishing, and IPsec VPN connectivity, while providing the throughput and capacity for modern, bandwidth-intensive networks. 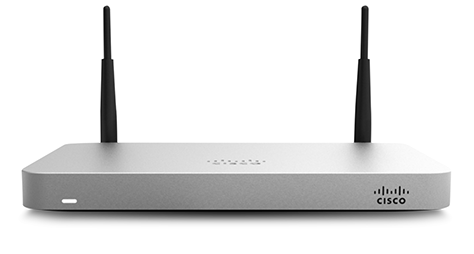 Comprehensive Wireless Security in a Single Box, from Premier Cisco Meraki Partner Corporate Armor. • Identity-based security policies and application management. enforcement (Google/Bing), and YouTube for schools. SNORT® signature database from SourceFire. on Layer & application type (e.g. YouTube, Skype, P2P). 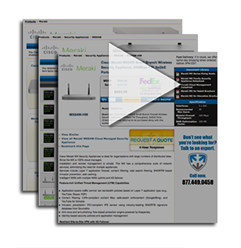 • Built-in DHCP, NAT, QoS, and VLAN management services. • Web caching: accelerates frequently accessed content. outages and fast failover, including 3G/4G USB modems. multi-site deployments with tens of thousands of devices. connectivity issues and power loss, and auditable change logs. details archived in the cloud. 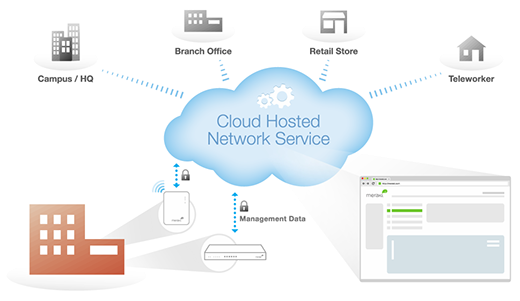 key exchange via Cisco Meraki's secure cloud. • Automatic failover to secondary WAN link or 4G connection. • Interoperates with standards-based IPSec VPNs. • Automated MPLS to VPN failover. and Android clients with no per-user licensing fees. The MX hardware platform is purpose-built for Layer 7 deep packet inspection, with advanced security features including IPS, content filtering web search filtering anti-virus/anti-phishing, and IPsec VPN connectivity, while providing the throughput and capacity for modern bandwidth-intensive networks. The integrated Sourcefir SNORT® engine delivers superior intrusion prevention coverage, a key requirement for PCI 2.0 compliance. The MX also uses the Webroot® BrightCloud URL categorization database for CIPA / IWF compliant content-filtering and Kaspersky® SafeStream engine for anti-virus / anti-phishing filtering. Meraki’s founders invented Cloud Networking while working as grad students at M.I.T. Cisco Meraki now has a complete line of cloud networking products that power over 20,000 customer networks, including massive global deployments with tens of thousands of devices. configuration settings from the cloud. to-site VPN tunnels, and provide 24x7 network monitoring. completely eliminates the need for training. the right policies for each class of users. The Meraki dashboard provides deep visibility and control over all of your Security Appliances from any Internet-accessible device, anytime, anywhere. View networked clients, bandwidth consumption, and application usage across all sites - and push policies to block, shape, or whitelist activity to optimize performance and user experience. the power of cloud networking. ©Copyright 2016 - Corporate Armor Inc. - All Rights Reserved - All Logos, Trademarks, Descriptions, Documents & Images are the property of their respective owner.